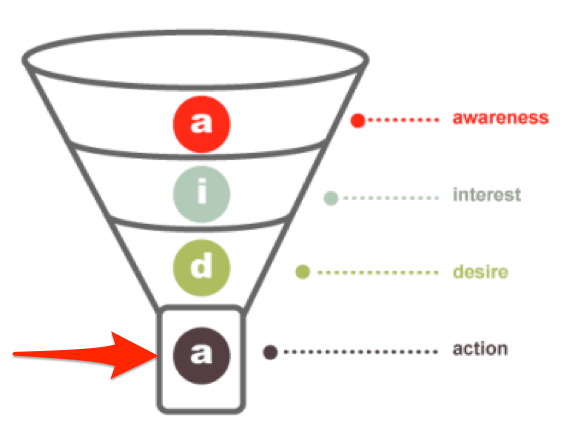 How many articles have you read recently about the “conversion funnel”? Likely a lot! You’re probably hearing, seeing, and having the term “conversion funnel” shoved in front of your eyeballs all day long. I personally come across conversion funnel information dozens of times during my research and reading—every single day. Because an optimized conversion funnel is critical to your online marketing success. Don’t think you have a conversion funnel in place? Even if your goal is to get your visitor to take a simple action—such as signing up for a free newsletter—you have a conversion funnel. A conversion funnel is really an idea or a way to visualize and comprehend the flow and conversion of potential customers into paying customers. If you can understand and analyze the process, then you can take actions to improve that flow. So what exactly is a funnel? Let’s look at the most common definition. 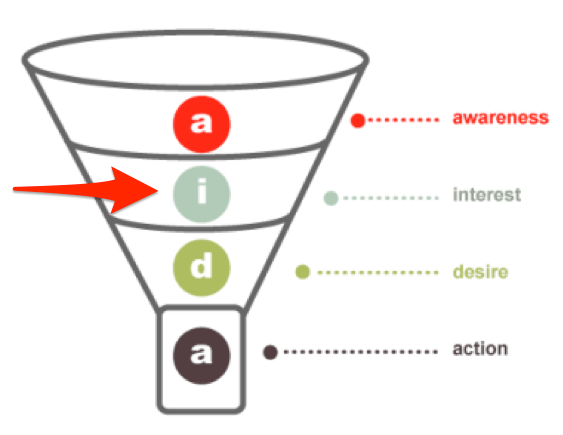 When diagramming a conversion funnel, the noun form of funnel is used. First, your potential customer becomes aware of you or your product. As you can see, the makers of this funnel diagram have more goals in their funnel. Monitoring these goals will help them maximize the amount of prospects that arrive at the “purchase” level of the funnel. 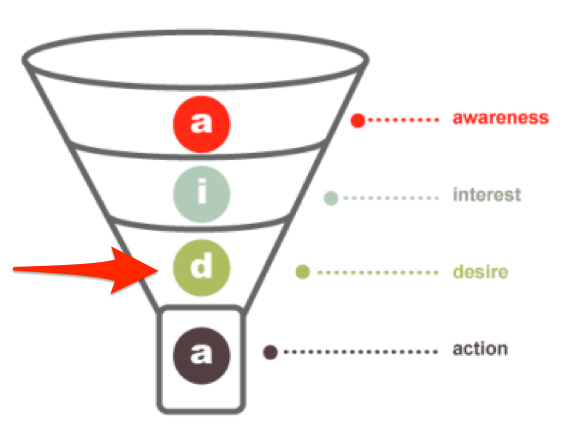 Your conversion funnel isn’t actually a funnel! What happens when you take a real funnel and pour liquid into it? All of the liquid—that’s 100%—will be forced through the small hole in the bottom of the funnel. It has to go somewhere. Now put your potential customers through your imaginary funnel. What happens when you pour your customers into that funnel? Only 1–5% of the customers who enter your funnel come out the bottom! Where did those potential customers go? They didn’t magically disappear. The truth is your funnel has holes at each level. Think of it like a set of filters. Each level of the funnel will have it’s own filter and only the ones who qualify make it to the next level. The others leave your funnel through the side. Of course, you could just let these potential buyers go… but you likely worked hard or even paid for those leads, right? The simplest plan to get them back is to put them into a different funnel—with a different offer they may be more interested in. For example, if they aren’t interested in buying a $ 97 product, you could try to down-sell them to a $ 27 product. Now that we’ve covered the basics of the funnel—and analyzed how and why they work—let’s build a simple funnel you can use in your online marketing efforts. Before you start, remember that building an effective conversion funnel takes time. It doesn’t happen overnight. And, if you’re learning how to market—and putting that advice into practice—you already have a funnel. You just need to understand it, analyze it, and consistently improve it. 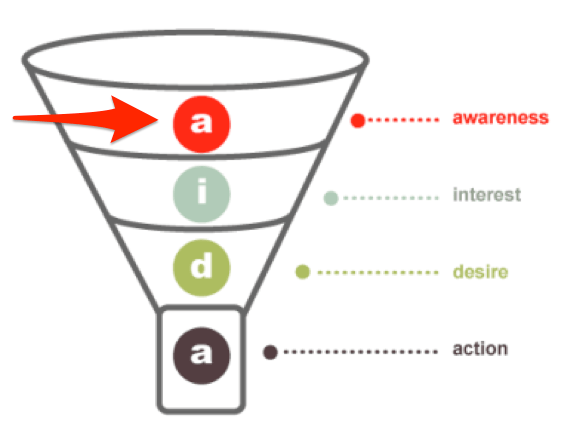 For our example funnel, we’ll use the image from the first diagram in this post with the levels: “Awareness,” “Interest,” “Desire,” and “Action” (AIDA). 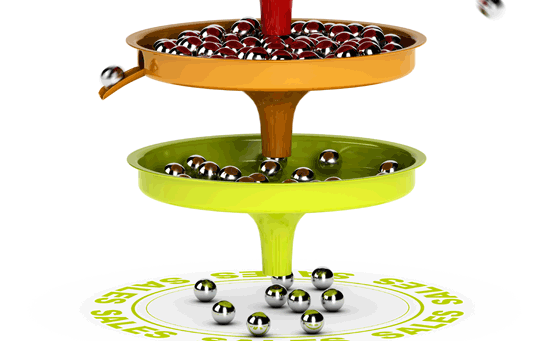 Our goal is to increase the percentage of prospects traveling through each step in the funnel. To have a conversion funnel you have to pull (not pour) prospects into your funnel. You do this by making people aware. Did you advertise? If so, what is your click through rate? Or how many people saw your ad and clicked on it? Do people find you through social media? If so, do they click through to your website to learn more? Make sure you’re properly targeting your customers so you aren’t working on pulling the wrong type—or completely unqualified customers—into your funnel. You’ll spend too much time and money trying to convert them. Think of who your ideal client is and target them. You can always cast a wider net later. After you pull prospects into your funnel, you need to build their interest in your product or service. Your content and website are possibly the best tools for doing this. So how can you tell if your “interest” level of the funnel is working? I recommend asking for an action that you can measure—most often a signup form with a bait piece. Crafting a good bait piece—and asking your visitors to exchange their email information for that free goodie—is a great way to see who has more interest in your product or service. Now it’s time to work towards making your leads (the people who opted-in for your bait piece) even more interested in your product or service. Make them desire it! An autoresponder series is perfect for this. It continues to build the relationship between you (the marketer) and your potential customers. Not sure how to take advantage of an autoresponder series? Check out this article. Remember people most often desire a solution to a problem. What problem are you going to solve with your product or service? Make them desire that solution and you won’t need to promote the product! Again a good copywriter can be worth his or her weight in gold when turning interest into desire. This level of the funnel can be a little tricky to analyze. But a measurable metric is how many people take the action you ask for. You’ll know you’re developing more desire as you get a higher percentage of prospects to take action. You want them to buy! As you likely notice, only a small percentage of prospects make it to this level. That’s why you should use the conversion funnel to analyze your sales process and make improvements at each level. Think about it this way: A 10% increase in the leads you get could mean an extra sale at the end. Once someone buys, don’t stop there. Your best customers are repeat customers. Think about other product funnels you could move them into. If you don’t have any, it might be time to expand your product line, create a new service, or even promote affiliate products. All is not lost if your prospects don’t take action the first time they go through your sales funnel. If they jump out of your funnel, find another approach to appeal to them. See if you can tempt them back in with a better or different offer. How could you motivate the people who didn’t take action? What objections were there? Can you eliminate them? These questions—and their answers—will help you tailor your conversion funnel to perform at it’s best. Are you using the conversion funnel to analyze and improve your marketing efforts? Let us know by commenting below. Don’t miss other Crazy Egg articles by Christina Gillick. The post A Simple Guide to Understanding and Creating a Website Conversion Funnel appeared first on The Daily Egg.